Wow, I don't even know where to start or how to start my update. A lot has happened here in Taipei, and back home. Maybe I'd start with the most unfortunate event that happened to my hometown last Saturday. Typhoon Ondoy hit Manila last Saturday. Many lives were taken, houses destroyed, people injured. I cannot explain how I felt because aside from the sadness buried in my heart after reading updates from Twitter and Facebook, there was guilt in between. Guilt that I should have been there experiencing this together with my fellow Filipinos. This year, our nation has been struck with so many challenges. From the master rapper's death, to the dreaded ah1n1 virus, to a beloved president's passing. I think all I can do for now is pray and have an unceasing faith in God. Although I am thankful that my family is safe, it still breaks my heart every time I hear stories that my friends and their families have gone through. And I shall continue praying so they can cope well with their situation, against all odds. As far as my studies is concerned, I'm doing pretty okay. The readings, even if they're couple of inches thick, I still find them interesting. Afterall, masters program is about higher learning. I have to read fast and understand them well, and not to waste so much time. I'm discipling myself and scheduling things step by step. But Sunday is definitely mine. My friends and I go to church and spend time together. 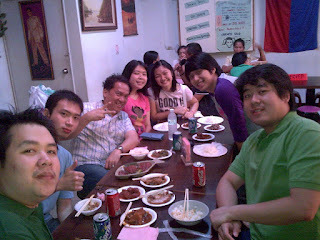 Last Sunday we went to Minquan E. Road- the Filipino Community here in Taiwan. We're so happy we finally saw Filipino goodies and ate Filipino foods. It's one of our happiest days because we're so dying to eat Filipino home-cooked meals and alas our wish was granted. We scoured through ShinKong Mitsukoshi and Kmall after, then had dinner at KFC. Yes the chicken cooked and tasted Western, no hint of Chinese flavor, thank heavens. And tomorrow is my special day. I don't know how it'll go but one thing for sure, I'll celebrate it with my Filipino friends here, Bea and Diet. Too bad tomorrow's the scheduled outage at home… I'll be able to talk to mom and dad in the evening, and skype with my girls… I miss them so much but thanks to God's gift of technology, we can see each other daily.